Alyssa Milano attended the ‘Project Runway All-Stars’ Season 3 viewing party held at Hudson Hotel in New York City yesterday evening. The ‘Mistresses’ actress wore a Peter Pilotto ‘Farah’ mock-turtleneck-collar dress from the Fall 2013 collection in a characteristically eye-catching graphic print with scuba-esque detailing, making for a show-stopping red carpet entrance. Sadly, I don’t think this is the right dress for Alyssa. Even though she’s working it, it’s light years outside her comfort zone and I don’t know if it’s the neckline, the print, the colour-block detailing or all of the above, but the look appears to stumpify her. 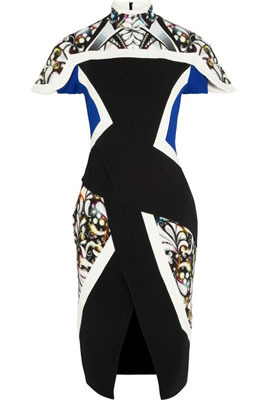 You can buy Alyssa’s Peter Pilotto Farah Dress from Net-A-Porter.com and ModaOperandi.com.